Giving to Riverside Military Academy is an act of faith; an expression of your belief that Riverside is an organization that is sound, stable, and making a difference in the lives of young men. Planned gifts provide resources that preserve the future of Riverside. Because the future of Riverside is as important as the present, more donors are including RMA in their estate plans. Those who have made a special commitment, through a planned gift, to the advancement of Riverside Military Academy join each other in membership in The Riverside Military Academy Legacy Society. We'd love to welcome YOU as our newest member! Naming Riverside Military Academy as the beneficiary of a qualified retirement plan asset such as a 401(k), 403(b), IRA, Keogh, profit-sharing pension plan or other donor-advised funds, will accomplish a charitable goal while realizing significant tax savings. There are many giving options available to you, such as naming Riverside as a beneficiary in your will and other gifts that still allow for you to care for your family during your lifetime. For more information, please find our contact info below, or submit this form. I have already included Riverside Military Academy in my estate plans. I haven't made plans for Riverside Military Academy in my estate, but it's on my to-do list. If you are working with a professional advisor or advising a donor, here's a handy guide for including Riverside Military Academy in a charitable estate plan. Dr. Donald M. Gilner, RMA class of 1955, was born and raised in Atlanta, but his father was a first generation Polish immigrant to America. He was a butcher and set up business in Atlanta as a slaughterer. The family struggled in the early years, and Dr. Gilner has memories of doing without, but he says, "I got a very clear message if someone is in trouble you have to reach out." In his medical practice, Dr. Gilner never turned down a patient for financial reasons. "We took care of everyone. If someone was written up in the newspaper as a hardship case, we helped," said Dr. Gilner. "It's a natural response, in part, because of the way I was raised." Dr. Gilner, now retired from private practice and from the USAF Reserve, volunteers at the Atlanta VA and has made medical mission trips. 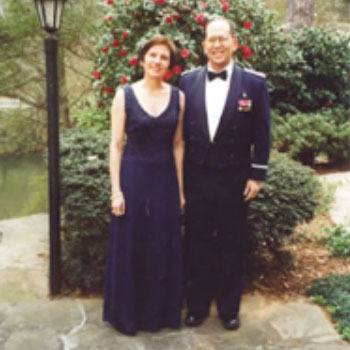 Through the Jewish Federation of Greater Atlanta he and his wife, Celia, contribute to a variety of causes, including Riverside. "I came to Riverside mid-year my freshman year with D's and C's. I would not be a physician today if I had continued on the path I was on; Riverside turned me around." The Gilners are extending their annual support of Riverside by including Riverside in their estate plans. The couple's IRA will eventually pass to the Jewish Federation, which will distribute the funds to the entities specified by the Gilners. "When people think of legacy gifts, they tend to think of large amounts of money, and that's not true. I think people need to be educated that they can leave Riverside, or any organization, any amount they want," said Dr. Gilner. "There is no minimum." Riverside's Legacy Society is comprised of alumni and friends whose estate plans include gifts to Riverside. There is no minimum bequest requirement to become a member of the Legacy Society, in fact, the planned bequests from current Society members range in size from a few thousand dollars to six-figure gifts. Documentation of the intended bequest is all that is required for Society recognition. Bequests can be changed at any time. The Gilners and others who have made plans to benefit Riverside in the years to come recognize the fact that sometimes the good we do in life comes to fruition long after we're around to see it happen. Charles "Chuck" Cook, '74, is one of several Riverside alumni who have included the Academy in their estate plans. In his own words in a letter written to Riverside, Cook articulates his reasons for giving back. Enclosed please find a copy of the letter from my financial advisor estimating the current and future value of my trust fund. 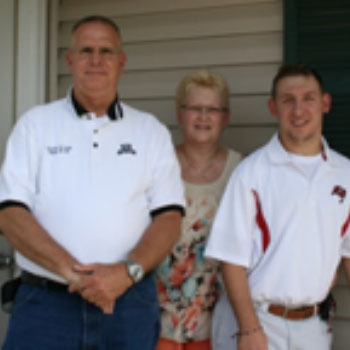 "When having to consider who to give the funds to upon Tyler's death, I admit that I had some blank moments. Other than Tyler, my son by adoption who has cerebral palsy, who will never be married or have children of his own, I have no surviving relatives. So for months I racked my brain - who should get the funds? Who needs the funds? "Then one evening, sitting alone, I was reminiscing about my youth and my escapades. My mind wandered back to my days before I attended RMA. And then I remembered my days at RMA. There was a measurable difference in my life during my attendance at RMA and afterward. I began to take measure of the successes that I was fortunate to have come my way. And I began to question what I would have become had I never attended RMA and the thought was very frightening, very frightening. Though I only attended RMA for two years (1972-1974) I came to realize that everything I have become, every success that has come my way, and the financial security that I now enjoy I could trace back to RMA. "With this realization came the answer to my question. As I look at the RMA campus today it bears little resemblance to the RMA that I knew. However, it is clear that RMA continues to make a difference in the students' lives that are fortunate to be able to attend RMA today. And we don't know the contributions those students will achieve as they continue to grow as adults and leaders within their communities. But, like myself, at some point in time I hope they will come to realize the roots of their successes and realize it all comes back to RMA. "I give these funds to RMA without conditions, restrictions, or specifications. I have faith and trust in the Board of Trustees that any funds given to RMA will be used only in the best interests of RMA and the fortunate students who attend it."